This bright end of terrace town house comprises 1 double + 2 twin bedrooms, bathroom and downstairs shower room. Lounge/diner and kitchen. Air-con/heating and ceiling fans. Washing machine also available. Offering comfortable self-catering accommodation for up to 6 people. The back terrace catches the sun in the morning and overlooks the pool, perfect if you have young children. If you are a devoted sun worshipper try the roof solarium. The front terrace benefits from the sun all afternoon to the end of the day - perfect for lazy evening dining. The kitchen is fully equipped for those wishing to self-cater - twice weekly markets in Los Alcazares are a great source of fresh local ingredients. However, you are on holiday so if you would rather eat out there are numerous restaurants and bars a short walk away. The clean and sandy beaches of Los Alcazares are also within walking distance. Transport to and from the House : We can arrange for you to be transferred from Murcia San Javier airport if required. Having moved to Scotland in my twenties for work I ended up getting married and stayed. I ran a busy B&B for over 10 years and have now returned to my original profession as a Dispensing Optician. One of my husband's ambitions was to own a home in Spain and in 2000 that became a possibility, so we set out to find our perfect family holiday home. We viewed numerous properties, non of which were quite right until we found 198. As soon as we walked into the house we both knew we had found the right one - even though it was still a building site at the time! We have never regretted our decision. We had written out a list of things we wanted from our new home and it ticked all the boxes. It's one of the best (if not the best) positioned houses on the development. Overlooking the garden and pool area makes for a very easy holiday with children. As it is end of terrace it has an additional window - which makes it very light compared to the other houses. November 2013 we had the front garden fully tiled over and installed a brick BBQ - much requested by guests. December 2015 we installed the new kitchen. Please check out the welcome information on-line. There are two terraces, one located at the rear of the property overlooking the communal garden and pool. Another located at the front entrance to the property overlooking private garden. We would ask any guests who wish to smoke to do so outside the house and please dispose of litter responsibly. Recently returned from a weeks stay in Louise's lovely holiday home. We have been visiting Spain for many years and have always rented accommodation. This house is by far the best accommodation we have ever stayed in. It was spotlessly clean, beautifully furnished, and equipped to meet every need. The grounds and pool were immaculate. Supermarkets and excellent restaurants were a short walk away. Cannot recommend the house highly enough. Thank you Louise. Great property, great location. Everything you would need is in the villa. 5 minutes walk from everything. Many thanks for letting us stay. This was my 11th trip to this resort and I have stayed at this complex before. Louise's property is HEAD AND SHOULDERS above any previous accommodation we have rented. It is beautifully clean, well appointed and even provided beach towels. From the Airport transfers to the flexible check in time, we couldnt fault this holiday. thanks so very much! Thank you Sue for your feedback. I am very pleased to hear that you all enjoyed your stay and that we provided accommodation and service to your satisfaction. Will let the team in Spain know. Very disappointed with the bed linen and towels on arrival pillows very stained, sheets had stains, had to wash bath towels before use, downstairs bathroom and lounge dirty. Overall a lovely house but cleanliness not good. I was surprised and disappointed that your stay did not meet with your expectations. This is the first time that any of my guests have commented that the house was not "clean". As I do not live in Spain I have to rely on my housekeeper to bring issues to my attention (or guests bringing matters to my attention). Did you contact Stuart when you arrived? I wish you had contacted me and then I could have dealt with the matter immediately. I have contacted my housekeeper in Spain and await the reply. Beautiful House with every convenience!! 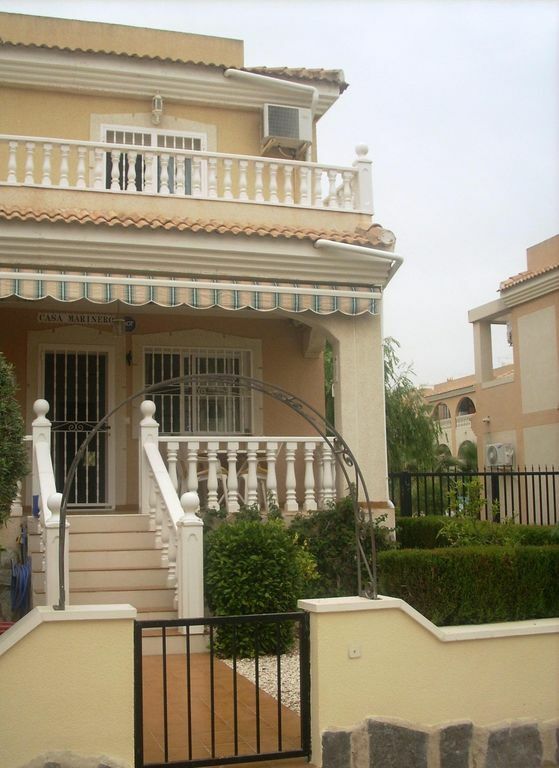 We were absolutely delighted to stay at this lovely house in Los Alcazares. A wonderful surprise was the brand new kitchen that Louise and Ian had just had fitted. Everything else was in tip top condition and we were very easily accommodated - despite being 6 of us there was somewhere for everyone to just "be". The kids loved the balcony and the roof terrace and my wife and I enjoyed the front veranda at lunchtime and the lower terrace at the back in the evening - perfect for a glass of something cold whilst we watched the kids in the pool...Bliss! As has been reported in other reviews there are a plethora of restaurants and bars a short walk away plus Mercadona (a Spanish supermarket) as well as a decent Lidl very nearby so shopping for essentials was hardly any chore. In conclusion this is a house that offers every convenience whilst being positioned in a nice quiet street and with easy access to everything you might need or want on your holiday. Thanks Louise and Ian - we will doubtless be back!! Thank you Mark for your comments. So pleased that your whole family enjoyed a relaxing holiday and that the accommodation was to your satisfaction. Our second time to this town house and our fifth time to el divino. The house had everything we needed and more children love playing in the pool. Brilliant holiday will be back again. Thanks Louise and Iain for letting us stay at your lovely house. Thanks for your feedback Stephen. Very happy that your whole family enjoyed their stay. If the kids are occupied and content Mum and Dad get to have a good time too!! Extra charges - £100.00 damage deposit will be charged four weeks prior to arrival. This will be refunded to you within 14 days of the end of your holiday providing the property and contents are undamaged.